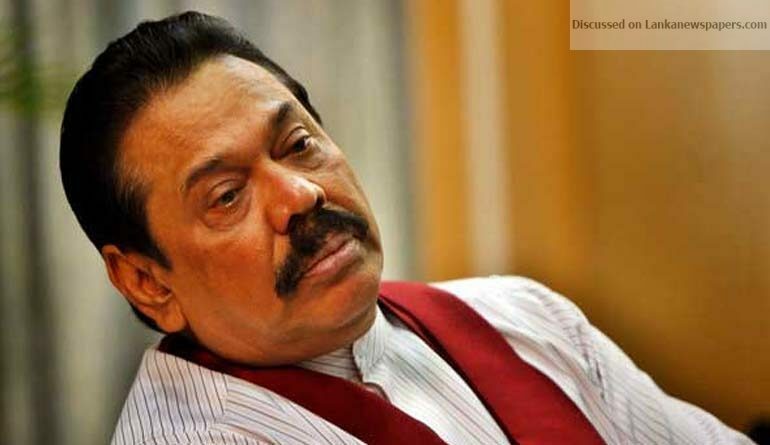 Mahinda comes to Ranil’s rescue once again! The so called new Cabinet of Ministers, which turned out to be the result of the fourth Cabinet reshuffle since the Yahapalana Government came into power in 2015, was announced on International May Day (1) with nine incumbent Ministers seeing a change in their portfolios, five current Ministers seeing only an addition of portfolios, three incumbent Ministers retaining the same portfolios and only one new Minister being appointed. Former Minister of Fisheries and Aquatic Resources Development Mahinda Amaraweera was appointed as the Minister of Agriculture while former Minister of Agriculture Duminda Dissanayake was appointed as the Minister of Irrigation and Water Resources Management, and Disaster Management. Former Minister of Special Assignment Dr. Sarath Amunugama was appointed as the Minister of Science, Technology and Research, and Skills Development and Vocational Training, and Hill Country Heritage. The Special Assignment portfolio no longer exists. Former Minister of National Co-existence, Reconciliation and Official Languages Mano Ganesan retained the Reconciliation and Official Languages portfolios and was also appointed as the Minister of National Integration. Prior to the transfer, the subject of National Integration was held by President Maithripala Sirisena. The National Co-existence portfolio no longer exists. Former Minister of Rural Economic Affairs P. Harrison was appointed as the Minister of Social Empowerment. Former Minister of Higher Education and Highways Kabir Hashim retained the Highways portfolio and was also appointed as the Minister of Road Development. Former Minister of Internal Affairs, Wayamba Development and Cultural Affairs S. B. Navinna retained the Internal Affairs and Wayamba Development portfolios. Former Minister of Wildlife and Sustainable Development Ravindra Samaraweera was appointed as the Minister of Labour and Trade Union Relations. Former Minister of Prison Reforms, Rehabilitation, Resettlement and Hindu Religious Affairs D.M. Swaminathan retained the Rehabilitation, Resettlement, and Hindu Religious Affairs portfolios and was also appointed as the Minister of Northern Development. Former Minister of Irrigation and Water Resources Management Wijith Wijayamuni Zoysa was appointed as the Minister of Fisheries and Aquatic Resources Development, and Rural Economy. Incumbent Minister of Justice Thalatha Atukorale was also appointed as the Minister of Prison Reforms. Incumbent Minister of Regional Development Field Marshal Sarath Fonseka was also appointed as the Minister of Sustainable Development and Wildlife. Incumbent Minister of Primary Industries Daya Gamage was also appointed as the Minister of Social Welfare. Incumbent Minister of Youth Affairs and Southern Development Sagala Ratnayake was also appointed as the Minister of Project Management. Incumbent Minister of Public Administration and Management, and Law and Order Ranjith Madduma Bandara was reappointed as the same. Incumbent Minister of Public Enterprise and Kandy Development Lakshman Kiriella was reappointed as the same. Incumbent Minister of Sports, and Provincial Councils and Local Government Faiszer Musthapha was reappointed as the same. Parliamentarian President’s Counsel Dr. Wijeyadasa Rajapakshe was appointed as the Minister of Higher Education and Cultural Affairs. Even though, it was highly speculated former minister Ravi Karunanayake would also be sworn in as the Minister of Tourism such did not take place up to date. Karunanayake quit in August 2017, owing to the findings of a Presidential probe into the Bond scams and Rajapakshe was removed, in August 2017 for violating collective Cabinet responsibility when he criticized the Hambantota Port deal with China. The UNP lobbied heavily for the appointment of Karunanayake but President Sirisena remained adamant. The Cabinet reshuffle also saw Samurdi and Labour subjects which were under SLFP ministers previously being transferred to the UNP. Even though now the Cabinet has more UNP flavour to it, in response a repeated grouse the party made as an excuse against criticism on Government’s poor performance for the past three years, it appears that UNP is still not happy with what they already have. It was not a secret that many who held State and Deputy Ministerial portfolios expected a Cabinet Ministerial portfolio while those already in the Cabinet were expecting more powerful or better portfolios. In addition, some backbenchers of the party who appeared to stand by PM Ranil Wickremesinghe against all odds were expecting at least a Deputy Ministerial portfolio. The disappointment was made public on two occasions through remarks made by newly appointed Wildlife Minister Sarath Fonseka and Deputy Minister Ranjan Ramanayake. One wonders whether the main qualification needed to get a Cabinet portfolio is engaging in corruption, Deputy Minister Ranjan Ramanayake said. Ramanayake came out with this statement responding to the Cabinet reshuffle and the reshuffling of State and Deputy Ministers during the last two days. “I have not been engaged in corruption and had got only a Deputy Minister’s post and I wonder whether the main qualification needed to get Cabinet portfolios is engaging in corruption,” Ramanayake said. Meanwhile, Minister of Sustainable Development, Regional Development and Wildlife Sarath Fonseka on Friday (4) alleged that although Prime Minister Wickremesinghe had proposed his name to head the Ministry of Law and Order it had been scuttled by the President. He claimed that President Sirisena had informed him that the most recent Cabinet reshuffle had been carried out after having considered the perspectives of foreign nations towards the country. Fonseka added that the President had confided in him that he had opposed the Law and Order Ministry being given to him due to requests from several countries, as he had previously served as a Commander of the Army. He further added that he was personally feeling disappointed about having supported the candidacy of Sirisena for the Presidency considering his servile attitude towards foreign powers. On Wednesday (2) internationally- acclaimed filmmaker Dr. Lester James Peries bid adieu to the nation in a funeral held under State patronage. Though the public, artistes and politicians were mourning the final departure of 99-year-old filmmaker with heavy hearts, those who were present near the main stage couldn’t help but notice a mini drama of flying saucers. President Sirisena was seated next to Sumithra Peries, wife of Dr. Peries and next to him were PM Wickremesinghe and former President Mahinda Rajapaksa. There was a teapoy in front the President and the Premier where there were two glasses of water topped with saucers kept for the two leaders. President Sirisena who flipped through a souvenir on Dr. Peries distributed during the funeral tried to keep it on the stool in front of him when his hand accidently came in contact with the glass of water making the saucer flying onto the floor. Both PM Wickremesinghe and former President Rajapaksa were seen turning their heads towards President Sirisena. After realizing what happened President Sirisena bent over to pick up the saucer while the other two looked away with a suppressed smirk and an expression which could be translated into “you clear your own mess”. Yet, things didn’t turn out well for PM Wickremesinghe either. When the later got up and was walking to the podium to deliver his speech, his foot came in contact with the leg of the glass stool making the saucer of his glass of water also flying off. Wickremesinghe, who appeared to realize that something happened turned back and noticed the fallen saucer. He was about to come back and pick it, when the former President Rajapaksa gestured him to proceed. “You go ahead, I’ll take care of this,” seemed what was conveyed as he then bent over, picked the saucer and placed it carefully over the glass of water. It was widely believed in political circles, that Rajapaksa backed the No-Confidence Motion against PM Wickremesinghe was to hurriedly move in at a time the latter was under immense pressure to step down from UNP leadership, in order to save Wickremesinghe and buy him more time. This allegation was later justified by those who claimed so by pointing out that all those, including UNP back-benchers united to protect Wickremesinghe and voted against the NCM. A few hours after the funeral, came the shocking news of President’s Chief of Staff I.H.K. Mahanama and State Timber Corporation Chairman P. Dissanayake being caught while they were in the process of accepting a bribe of Rs 20 million. The Commission to Investigate Allegations of Bribery or Corruption (CIABOC) on Thursday (3) arrested President’s Chief of Staff I.H.K. Mahanama and State Timber Corporation Chairman P. Dissanayake (Private Secretary to former President Chandrika Kumaratunga) while they were in the process of accepting a bribe of Rs 20 million, at a luxury hotel in Colombo, as an advance for a deal involving the sale of machines and equipment belonging to the Kantale Sugar Factory, to a private Indian company at a low price. The raid was conducted on a complaint made by an Indian national, who had previously had discussions with the suspects regarding the deal. CIABOC Officers said that the suspects had promised to sell the machines and equipment at Rs 540 million. They further stated that upon a request made by the Indian national to reduce the price, the suspects had reduced the price to Rs 100 million. The suspects had, however, demanded Rs 20 million as an advance for going ahead with the deal. President Sirisena ordered the interdiction of his Chief of Staff Dr. Mahanama and State Timber Corporation Chairman Dissanayake. Apart from their immediate suspension, the President has also advised the relevant authorities to take strict legal action against the offending duo. In a press statement released in this connection, the President has stated that the incident confirmed the importance, of establishing independent commissions, implementing Government policies against bribery and corruption, and the law enforcement authorities performing their duties impartially and independently. Meanwhile, Executive Director of the Campaign for Free and Fair Elections (CaFFE), Rajith Keerthi Tennakoon, claimed that the former Chairman of the Board of Investments, Upul Jayasuriya, had to resign from his post, following the revelation made about the sale agreement of the Kantale Sugar Factory (KSF) property. Tennakoon claimed that in 2017, Jayasuriya had announced to the media that the then Ministry of Lands had failed to clear the defunct machinery on the property and handover the buildings as well as release the lands to the investors, long after the agreement was entered into between the Government of Sri Lanka and the Indian company for the sale. Speaking at a media briefing, Tennakoon said that the estimated scrap value for the defunct machinery was Rs 50 million, which was later negotiated with the buyer to be sold for a lesser value. “This Investor has taken legal action through international arbitration against the aforementioned matters. They have also signed a security bank bond of US$ 10 million as part of the agreement. According to that agreement, 51 per cent of the ownership of the Sugar Factory would be held by the Sri Lanka Government and the balance 49 by the Indian Company. Thus, we ask the Government as to why they are not taking steps to execute that agreement,” Tennakoon further said. The ‘Lawyers for Democracy’ meanwhile, has hailed signs of non interference by President Sirisena in high profile arrests of Chief of Staff. “The stage was set for the bureaucracy to deal with corruption fearlessly only after the fall of the Rajapaksa administration in 2015. It is vital that the people recognize the courage displayed by officials in the Bribery Commission in the recent past where corruption cases were filed against powerful former officials like Gotabaya Rajapaksa and a serving Court of Appeal Judge. Still, rogue elements mobilize supporters to protect the corrupt with the active support of the previous regime. In this moment, when President Sirisena’s Chief of Staff has been netted by an independent commission during a sting operation, as he was soliciting a Rs 20 million bribe, there is only one pertinent question to ask: Given the impunity the former regime showed to crimes by its inner circle, would the arrest of Gamini Senarath, former Chief of Staff to President Mahinda Rajapaksa ever have been possible during his reign? President Sirisena yesterday appointed Anuruddha Polgampola as the new chairman of the State Timber Corporation. Polgampola joined Sirisena leaving Sri Lanka Podujana Party earlier this year. The former JVP MP of Kegalle, resigned from his Parliament seat in 2008 following JVP Central Committee deciding to sack him from the party on his alleged involvement in a human trafficking case. He was interrogated by Japanese immigration officials in this case. “I refer to the first few paragraphs of the article under the title “WHO MESSED UP THE GAZETTE NOTIFICATION SUMMONING PARLIAMENT?” Since, we have our comments on it, we appreciate if you publish the clarification given below, as right of reply to the quoted paragraphs. It is true that a typological error has occurred, as stated in the said article. It is a human error. This is why a Notice of Correction was published under Gazette Extraordinary 2068/24 on 26.04.2018. When a public notice is given in this manner courtesy demands decent treatment than what has been done in this article. In addition, the reference to the “Chamber” in lieu of “Hall” of the Parliament is also highlighted, although these two terms are internationally used complementarily. To evaluate performance levels of our officials in the Presidential Secretariat to carry out their responsibilities, and of the Government as a whole based on a typological error definitely seeps below any imagination of sanity. It amounts to ridicule, because there are technically accepted norms and indicators for such evaluation. If we are to evaluate the quality of Ceylon Today on these referred references, it would certainly not do justice to your newspaper, and will not be a fair act at all, as the quality of newspapers is evaluated by more serious criteria than this type of journalistic behaviour.